Motions are grouped as type Roll, Pitch and Combined. Combined motions are best interpretation of LR intentions. Coordinate system is X fwd, Y port & Z up (from LR). 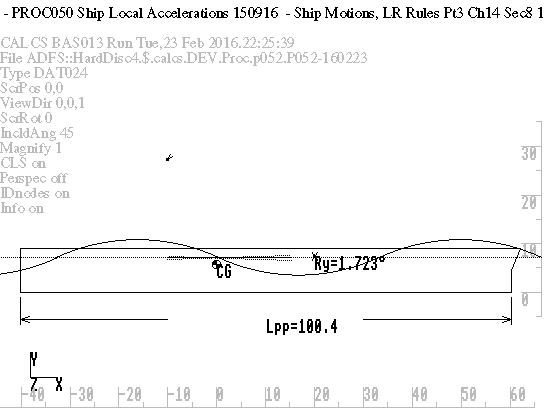 General datum for ship dimensions is Ship Bottom (AB Above Bottom), Aft Perpendicular (AP) and Ship Centre Line (transverse). Usage instructions: Gravity translational acceleration factors are output. The rotational factors need only to be multiplied by appropriate positional offsets of any point from the motion centroid to obtain translational factors due to rotational motion. 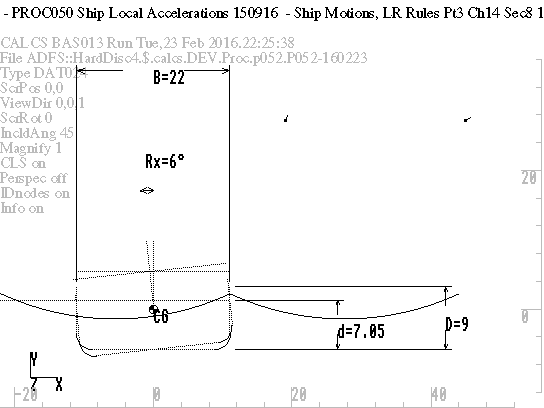 The LR analysis is suitable for conventional mono-hull vessels. The procedure provides an estimate of accelerations, suitable for the design of structures, at defined points. See also: BAS005 & BAS021. Procedures PROC050 & PROC052 are used in combination. This is shown in Input Format and the Project Example. The LR formulation provides estimates of parameters (Xcg. Zcg, GM, Tr, Tp or Th) which may not have known values and are then entered as zero. If SWH is entered as zero (undefined), the value is taken as for the LR survival condition. If Rx, Ry or`ah are zero they are interpolated using the LR survival SWH & specified SWH.